The following questions and answers are excerpted from a conversation that followed the NBR screening of Free Solo. Elizabeth Chai Vasarhelyi: We were interested in Alex and interested in his process and interested in who he is as a human. Originally, we didn’t know about the El Cap project. Alex brought that to the table. Jimmy Chin: When Alex told us that he wanted to free solo El Cap, we actually took a step back for several months and had to answer some hard questions for ourselves about whether or not this was the type of film we were ready to take on. For the obvious reason of risk, but also questions about how to do it and if that was even okay. ECV: And, also how the filming, itself, affects your subject. We knew that we would be in it together. That was the thing for me. Can you talk about portraying Alex as a complex character, not just as a high-risk climber in the film? ECV: Well, the character portrait was really important to us. We were interested in making a film that had depth, because the climb means more than just the climb. Hopefully, the film raises questions about what’s a meaningful life, and what are we doing with our lives. How do we confront our own fears? So, we were interested in those big questions, and the only way we could get to it was through the human character part of it. And, Alex is really interesting and very candid. He allowed us this wonderful access to be there while he prepared. When we first began shooting, Alex was internet dating. So, it was like we’re going to make a comedy. We thought it would be funny, and then he tells us about El Cap. Then he meets this wonderful woman, Sanni, who is just articulate emotionally. She’s got the self-confidence and self awareness and love for him to be able to push back and interact in ways that make Alex grow. So, as a documentary filmmaker that was a real opportunity. Also, the way that the crew was interacting with Alex was a huge part of this. Alex, you’ve interacted with a lot of film crews. How was this experience similar of different from ones that you’ve had? Alex Honnold: I mean it was similar in some ways, because the high angle filming was basically what I’ve done in the past but at a higher level. We all just spent more time on the wall making sure we were getting it. Because, over the two years that I was preparing to free solo El Cap, they were up there filming my preparation. So, basically we were all practicing what it is to be on the wall and shoot well. For me the huge difference was shooting the rest of my life. I’m used to shooting on the wall. As a professional climber that’s the day-to-day, in a way. But, to have someone in the van watching the relationship with my girlfriend was different. One of the things that I found kind of challenging was that we’d spend the whole day up on the wall preparing. You spend maybe eight hours physically toiling with the camera guy next to you. Then you get to the ground, and you’re like, “Now, it’s time to chill.” But, then a verité film crew picks you up and they’re like, “Okay, we’re all friends! Let’s go!” I was so pooped. Please just turn it off for a little while. But, I think that’s why the film does such a good job showing my real life, because that’s two years of my life right there. That’s it. What was it like for you to watch it? AH: It’s heinous. I think I saw it for the first time in this screening room. I was having flashbacks. Jimmy, can you talk about working with your crew on the wall? JC: Yes, the task really began in picking the team. We had an incredible team of really professional climbers that were also incredible cinematographers. That’s a very rare combination to have at the upper echelon. They have to be completely one hundred percent trustworthy as high end climbers. You should never have to worry about whether or not they’re going to make good decisions or if you trust them on the wall or if they can move quickly and handle all the stresses of being a climber. So, the discussion is always that you’re a climber first. And, then they are filming on top of it. There’s a handful of people in the world that can do it. It turns out, of course, that climbing is a small community on the upper echelon. So, we all have been friends with Alex, have climbed with Alex, several of them had been his climbing partners. It felt very intimate on top of everything else, and just an incredible crew. AH: In a lot of ways it made it easier for me to do my preparations, because a lot of the people that I was shooting with were the same people that I would have been up there with anyway just on the wall. You see a shot in the film of me and Mikey, the guy that’s covering his eyes all the time. ECV: The cinematographer who can’t watch. AH: The two of us are rappelling down the wall together, and we were doing that day in day out. We would rappel down the whole face, all three thousand feet together, so that I could work on some specific part of the climb. He would film it, and then we would just keep going towards the ground. And, that’s pretty much what we would have been doing anyway. It was perfect. I’m up here with my friends, we’re working on my project, and they’re making a great film about it. It’s all very ideal for me. ECV: That sounds very nice, but there was this other side to it. Everyone was so close that there was this special circle of trust that developed. Everyone was carrying the risk and living with the weight for those years. There was a commitment that was very special with the team. How close were any of you to not going through with this film? 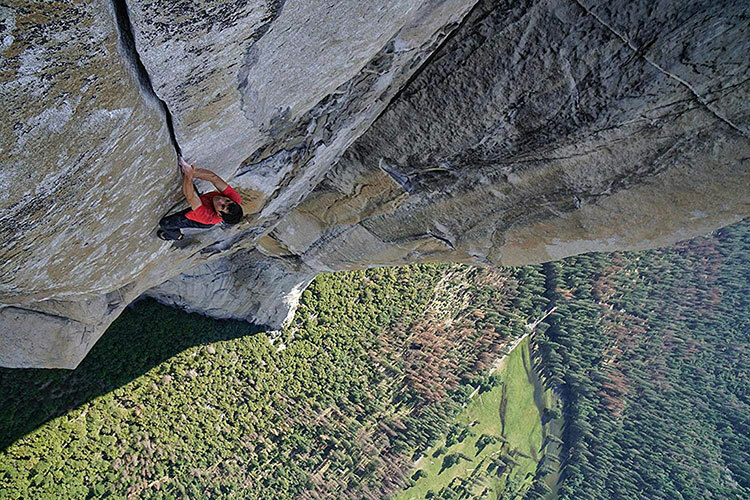 AH: I always wanted to free solo El Cap, and so whether the film existed or not I would have been working toward that goal. In some ways having the film involved made it easier to work on it just because I had people to talk to about it. so, I felt like I was fully committed to this process no matter what. Even if the filming was challenging sometimes like trying to have a conversation with my girlfriend with somebody in the van with us. Ultimately, I was like I’m still going down this path regardless. ECV: I personally think the camera in the van is great couples counseling. AH: In some ways it is though! It stresses the relationship in certain ways. We definitely grew faster than you would otherwise. Some people can date for a year by just going on the casual date a couple times a week. For us dating the first year was us living in a car together with somebody watching us talking about our feelings all the time. It’s a pretty intense way to start a relationship. ECV: The question does get to the existential part of the film which is the risk involved. How could we participate or enable something like this? I think the answer always comes back to the core message of the film which is the idea of a life well lived. This is what Alex was dreaming to do, and this is the life he chose. Our job was really to not mess it up. Not on our watch, and that was hard. That was the ethical debate that happened every day. We tried our best as filmmakers to insulate Alex from it while still having a lively discussion with him about his comfort zones. It was intense. We’re really happy he made it. When you’re on a wall that size is there improvisation at any point? AH: There is a fair amount of easy climbing on El Cap. So, all the stuff that I’m narrating are the hardest sections of the wall. But, there are easy sections of the wall. So, some of those I didn’t necessarily know every single hand and foot placement, because you just don’t need to. It’s like walking on the sidewalk or something. Or if the sidewalk was pitched back or something. There’s some improvisation, but I had climbed the route many times. So, it’s not totally improv, because I’ve done it before. I just didn’t have it perfectly memorized. Alex, can you talk about your foundation a bit more? AH: So, I started the Honnold Foundation about five years ago, and it’s sort of been steadily growing over time. This year I hired a full time Executive Director who has really taken it forward. We basically support solar for a more equitable world, trying to make the world a better place through solar projects. We’ve sort of split our time domestically and abroad. We’ve supported maybe three or four different projects in Africa and then a bunch of support for this group, GRID Alternatives, domestically. So, I’ve done installations with them in California. Basically, I’ve just been using the foundation as a vehicle to support projects around the world. Part of them stemmed from going on climbing expeditions with Jimmy. We went on a trip together to Chad in 2009, and it was one of my first times seeing that level of need in the world. Combine that with the fact that I was living in a van, and I had a very low overhead. I was very happy with my life making more than I need, but there was so much other need in the world. The foundation was a way to try to address that.